4.83 points at 12 votes (rank 784). Rombachs C64-Spieleführer II 9 1986 - "Vote 1"
Nick Faldo is one of the world's best English golf players. 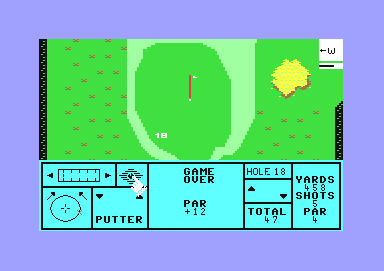 In this game, a golf match strechting over all 18 holes is simulated with Nick as a main person in the golf club "Royal St. George's Golf Club" in the English town Sandwich, where already World Cups have taken place and where people played for golfer honour and a prize money of 5 pounds in 1872. All difficulties of the original course are built in. The wind speed is not only taken account of, but also changes. The course is about 900 screens big. If required, a total overview can be shown. The simulation is completed controlled by joystick. The screen shows in the upper half a small section from the course, where the ball currently lies, as well es the direction and strength of the wind (upper right). When the ball is hit, the screen is swerved into the corresponding direction like a camera. Below the section you see the menu with the status messsages: At the right the distance from the starting point to the hole is given in English Yards, the number of strokes that an average golfer needs for the hole (PAR) and the number of strokes for this hole (SHOTS). In the middle of the display you see Nick Faldo and his caddie, who reaches him the required club and correspondingly comments this when the wrong club was chosen. In the left corner are the options: a bar with which the strengths of the stroke is given and next to it a square that shows a bigger part of the course on the screen if you go over it with the joystick and keep it pressed. At the circle at the lower left you can adjust the direction of the stroke. Next to it is the display showing with which club Nick Faldo is currently busy. The Driver brings the ball furthest, but it is only of good use if the ball lies on firm ground. At full impact you cover at bit more than a half screen height or a third of screen width on the overview map, which corresponds to approx. 270 yards. Then there are the clubs Wood 3 to Iron 9, which bring less vigour graduately. Iron 3 corresponds to approx. 100 yards at full vigour. Then there is the Wedge, that brings the ball back into the air from problematic grounds. And finally the Putter, that does the exact work to get the ball into the hole. 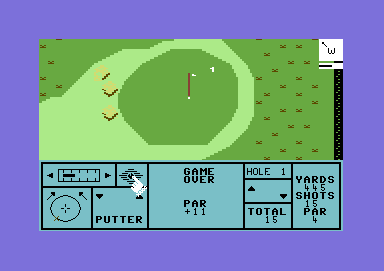 Point of tee off (you were here) and target hole (flags) are shown well on the overview map (second icon left of the indicator for the strength of the stroke). For this simply place the cursor on the icon and keep the fire button pressed. 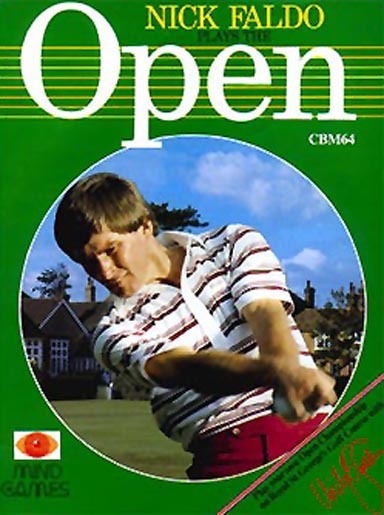 Rombachs C64-Spieleführer II: "Nick Faldo plays the open is the until now most realistic golf game for the C64, however, it is almost already a simulation and offers only little fun for action fans. All others, however, to whom accuracy and beauty of a game comes first before action and shooting, will be able to feel like Nick Faldo for a long time here and train for the golf world cup. But the game has one deficit: When you have finally played all 18 holes, which after all can last half an hour, the programme only comments with a succinct "Par+73", which means that you have used 73 strokes more than the average and you need to start with the next game.". This page was last modified on 14 December 2015, at 00:06.